The staff is very friendly and helpful. The location is central and easy to go to anywhere. The view from our room is stunning. Lovely, small inn in a great central location. Breakfasts were delicious and staff extremely helpful and friendly. The view is worth every penny. The staff are very welcoming, the suite is beautiful and the breakfast was amazing. This is our favorite place on the planet. We watched the sunset every night. We will be back! Amazing room with an absolutely stunning view of the caldera, even more beautiful at sunset. Very comfortable bed. Super clean. Good shower. Great breakfast. Friendly staff who were so helpful and catered to all of our needs. Fantastic location - Thira is so central for everything - very close to good bars, clubs and restaurants. Great value for money when you take into account what you get. Amazing Breakfast, excellent staff and breathtaking views!Highly reccomended!We will definitely come back! Thank you for the lovely stay!!! Location- The proximity to the center of town is good. A really beautiful place with attentive, friendly staff. The view from our room was spectacular. The stairs to our suite were a little steep but the awesome staff refused to let us take our luggage up or down, they took care of it for us. We Highly recommend. Large and comfortable room. Salted breakfast were great. The property is in walking distance to good restaurants. Lock in a great price for Modernity Suites – rated 9.3 by recent guests! 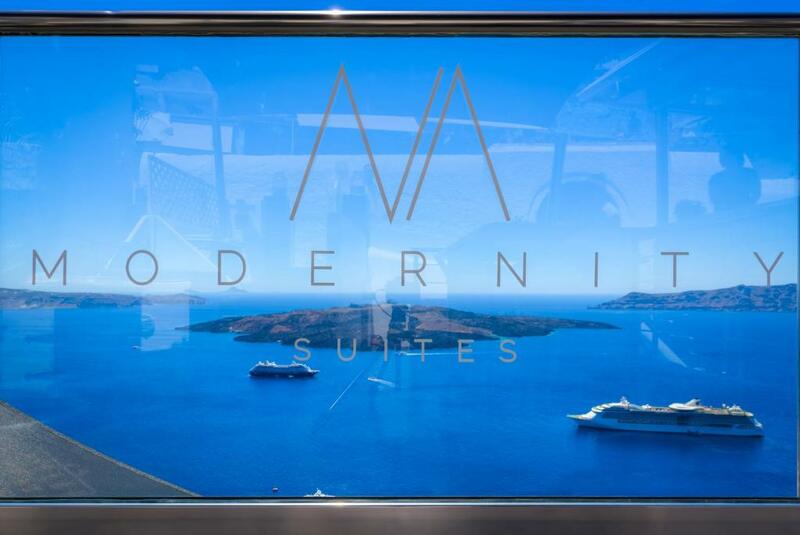 Modernity Suites This rating is a reflection of how the property compares to the industry standard when it comes to price, facilities and services available. It's based on a self-evaluation by the property. Use this rating to help choose your stay! 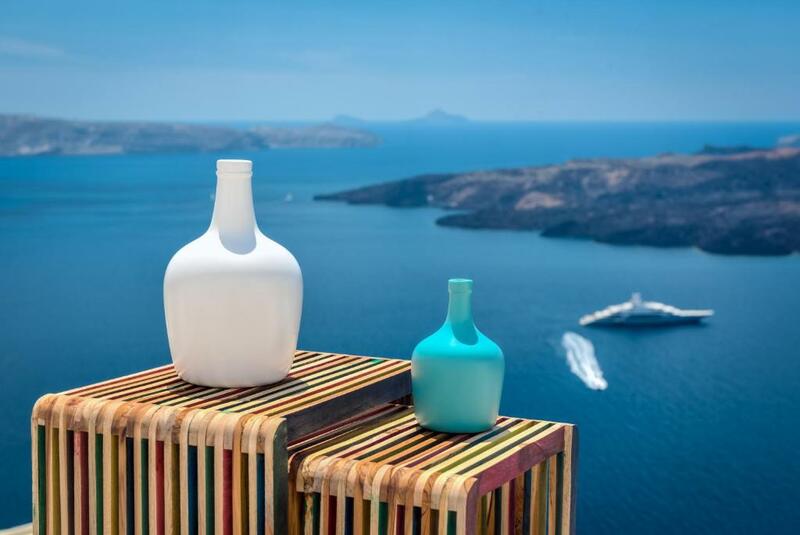 Perched on the famous Caldera, in Fira, the traditionally built Modernity Suites features elegantly decorated suites with outdoor hot tubs and panoramic views over the Aegean Sea and the Volcano. Free WiFi is offered throughout the property. 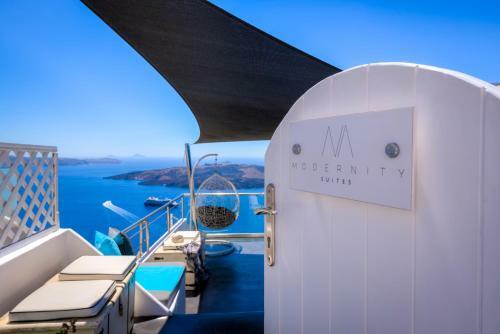 Fitted with built-in sofas, arched walls and modern elements, the suites at Modernity open to a terrace or balcony. Facilities include air conditioning, a mini-bar, a kettle and a tablet. The bathrooms have built-in showers, slippers and free toiletries. Guest can enjoy a daily breakfast at their private terrace, while a snack menu is also available throughout the day. A variety of shops, restaurants and bars can be found within walking distance from the property. The village of Oia with its famous sunset is at a distance of 9.3 mi, while Exo Gialos Beach is 1.2 mi away. Santorini Airport is 3.1 mi away. When would you like to stay at Modernity Suites? This suite features a balcony, sofa and soundproofing. This suite has a balcony, iPad and dining area. 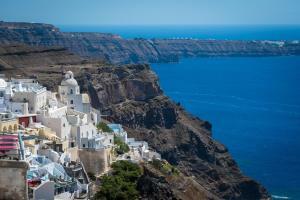 Find out what makes Santorini so special, explore its sunny, whitewashed alleys and immerse yourself in the Cycladic brio and cosmopolitan lifestyle. This one of a kind town, hanging leisurely over the Aegean Sea unravels its secrets in every step you take; a different view, a new spectacle, carefree people and elegant shops, cafés, restaurants and bars. Every day is a new experience, every picture is a new memory, and every step is a new adventure. 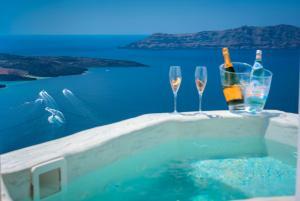 Modernity Suites is in the center of all this, surrounded by the exhilarating esprit of Santorini’sFira. 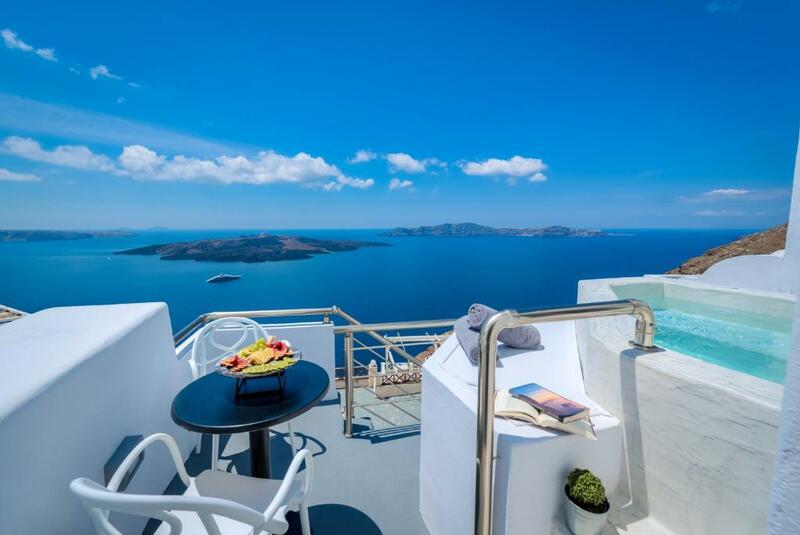 Its convenient location, its private balconies with the jaw- dropping views and the private Jacuzzis, its stylish décor and the outstanding services make Modernity Suites the perfect accommodation choice for the visitors of Santorini who want to see it all; experience it all; who want to be one with the unique spirit of this truly amazing island. House Rules Modernity Suites takes special requests – add in the next step! Modernity Suites accepts these cards and reserves the right to temporarily hold an amount prior to arrival. Please inform Modernity Suites of your expected arrival time in advance. You can use the Special Requests box when booking, or contact the property directly using the contact details in your confirmation. Panos was wonderful in every way possible. The hotel was amazing (in the centre of Fira and very clean) and the view was even better! Moreover, the staff was very welcoming and friendly. They even prepared snacks for us as we had to leave in the early morning and couldn’t eat breakfast. 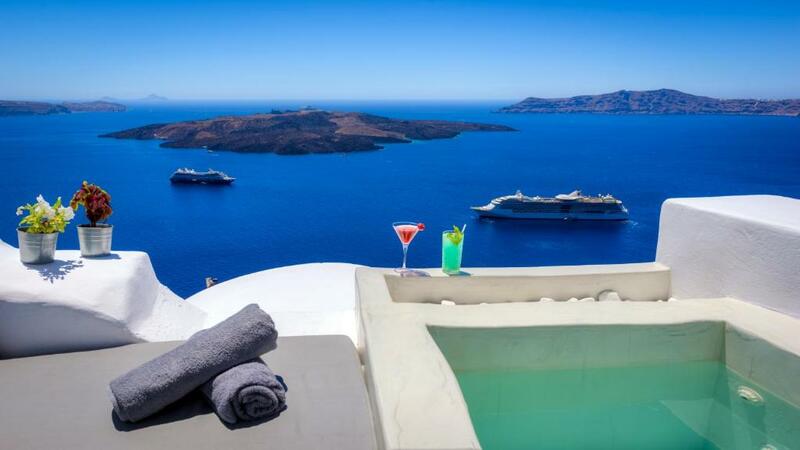 I would always stay here whenever I return to Santorini! nothing ...not even the limited breakfast that was part of the room and we had paid for. Not at all value for money. What surprised me was when the room was booked, our payment was to be made while we checked out but to our utter shock we were debited many days before we checked-in. Not at all happy with the service. One man attending to everything and no service was available after 6 pm till 9 am. 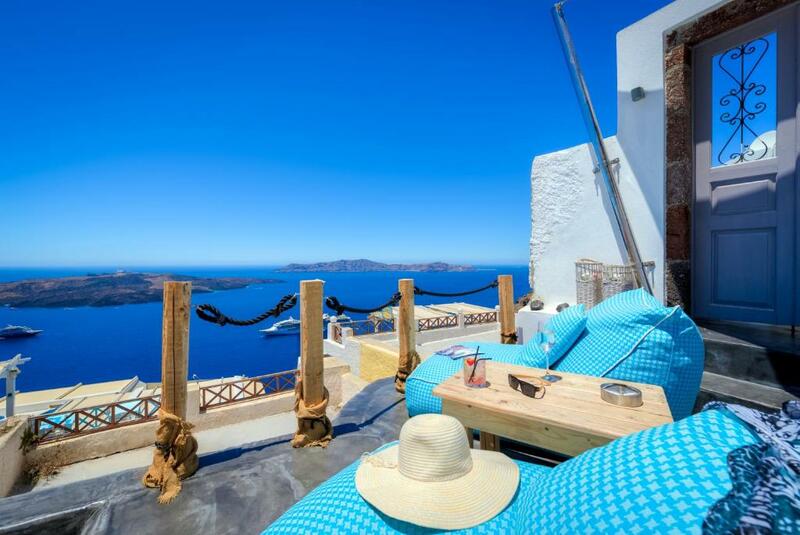 Excellent location in Fira. The guy in the reception was very helpful and nice. Good breakfast. Nothing!! We didn't want to leave!! This place was out of this world. The staff was amazing and went above and beyond. Excellent location in Fira! Close to everything and everywhere. The manager was super friendly and efficient! Breakfast scrumptious the view from room was excellent! Attention to details and friendly services spoke of it all. The personal service from Panos, the concierge, truly made the stay even more enjoyable. No request was a problem and he did it with a smile.